Railpictures.ca - Bill Thomson Photo: A CN freight lead by a pair of GMD SW1200RS units crosses a small bridge over a branch of the Thames River, at Mitchell on the Goderich Sub in April 1969. This of course is GEXR territory today. | Railpictures.ca – Canadian Railway Photography – photographie ferroviaire Canadienne. 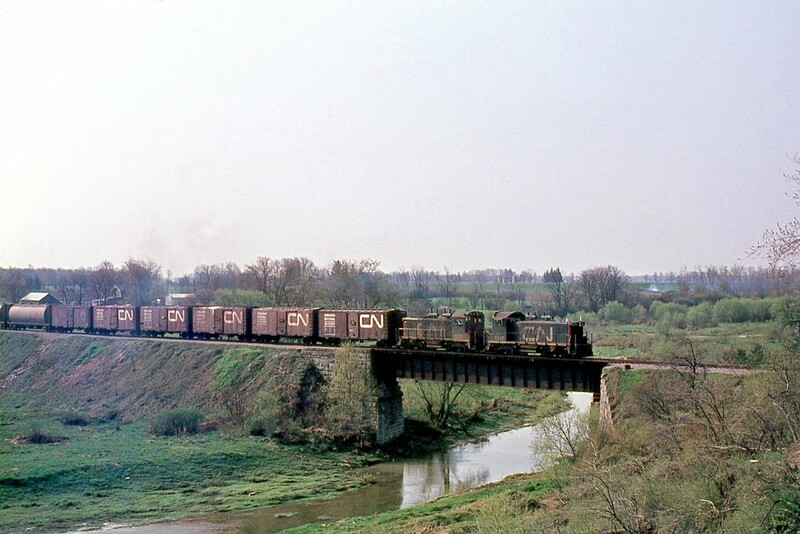 Caption: A CN freight lead by a pair of GMD SW1200RS units crosses a small bridge over a branch of the Thames River, at Mitchell on the Goderich Sub in April 1969. This of course is GEXR territory today. Hi Mr. Thompson….I sent a contact request to you through your profile page about the Mitchell station. Let me know if you got it – included was my email address. Jacob,the train is WESTBOUND, Stratford to Goderich,on the Goderich Subdivision. Cool shot Bill! Is this a northbound or a southbound? Great shot Mr. Thomson. Do you have a shot of the old Mitchell station too?